Joint Base Anacostia-Bolling (JBAB) is the result of the consolidation of Naval Support Facility Anacostia (NSF) and Bolling Air Force Base (BAFB). Prior to 2010 the bases were adjoining, but separate military installations. 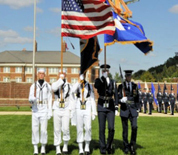 JBAB is home to several ceremonial units including the USAF Honor Guard, the USAF Band and the Navy Ceremonial Guard. Ceremonial support is provided by the base units to the White House, the Chairman of the Joint Chiefs of Staff, the Air Force Chief of Staffand the Secretary of the Air Force. Additional units housed at the Bolling AFB include HMX-1, the DC Army National Guard and the Marine Forces Reserve. This Bolling AFB (JBAB) directory features the critical info you’ll need to navigate through the many facilities and recreational opportunities available on base.